Visual Comfort impacts all of us; our ability to focus, work, create and much more. In some applications though, visual comfort has very immediate, serious and direct impacts on our ability to do our jobs. One such application is at border stations and ports of entry around the world. Here, staff need to visually monitor activity for prolonged periods of time. This is not an easy job, and environmental conditions can make it harder. 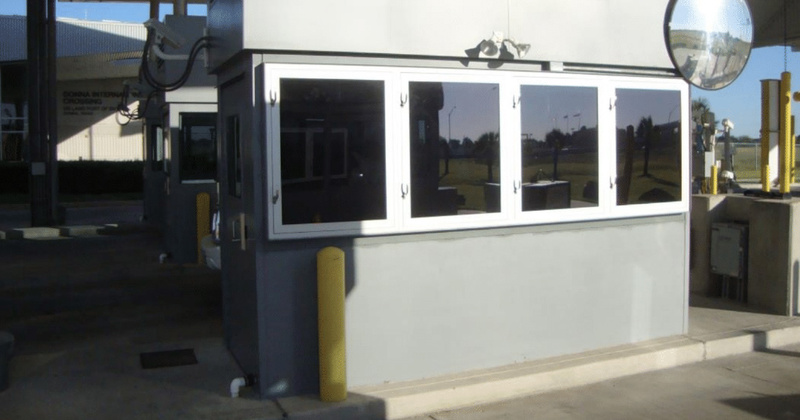 The report below was prepared by the US General Services Administration, the landlord for all federal government properties, and it analyzes the effect of traditional glass windows vs. electrochromic (EC) glass (also known as switchable glass) at the Land Port of Entry in Donna, Texas. In addition to many scientific measurements, GSA also surveyed Customs and Border Protection agents working at the facility, both in the command center and inspection booth, to get their reactions about the impact of electrochromic glass on visual comfort. Agents were unanimous in their preference for dynamic glass over the previous static glass windows. Perhaps the most notable result was a score of 8.77 out of 9 for the following: “Overall, the new switchable windows meet the outdoor visibility needs of my mission better than conventional windows”.